VOES switch: On performance engines this needs to be removed and the wire grounded. If left installed the voes will retard the ignition 24 to 28 degrees on low vacuum situations such as fast acceleration or high engine loads, a long duration cam will also reduce the intake vacuum causing the voes to kick in. (Get rid). Crankpin: Always use a 2 or 3 hole crank-pin rather than the single hole factory item this will help pull heat out of the piston domes. Oil temperature: Aim for a constant 210 to 220 degrees use an oil cooler if needed. Break in: Use a mineral based oil for 1500 miles then switch to fully sythinthetic and change every 3000 miles. Varey engine load to prevent bore glazing. Ignition advance: Stock advance on twin plug heads will destroy your engine within 350 miles, use correct timing, turning the backplate to retard the ignition 5 to 8 degrees will get the full advance right but you will lose the static and the engine will run like a pig low down. Always switch to single fire this will tax the system less as there is no wasted spark. A weak ignition system will make the engine look like its running rich. Shovel cylinders: Torque plates must be used on Shovel cylinders we have done tests to prove this, an engine was bored and honed un plated and run for 600 miles on strip down the cylinders clearly showed 5 points of leakage even though we measured this you could see this with your eyes, the 5 points were the stud points. We rebored with plates and stripped the engine again after another 600 miles perfect no leakage. Valve guides: Valve guide clearances especially on Shovels need tightening up, a problem we had when boring Shovel cylinders with torque plates was that the engine would burn oil after the rebore making it look like the bore job was wrong what it was was that the bore job sealed up that good that the oil on the intake stroke was being pulled down the valve guides even though the guides were within factory specs. Get your bores and guides done at the same time and always fit seals, oil reduces fuel octane a no no for higher compression. Evo big twin cases: The 90 to 95 cases are prone to cracking do not use these for any performance work as we have seen these crack during normal use. Cases from 90 up also got rid of the cast in steel Timkin insert. The 84 to 89 cases are the best. Evo flywheels: 93 up flywheels used the parallel pinion shaft these are prone to shearing the key way on performance jobs and wrecking your whole top end. Use Truett & Osborn fly-wheels and Jim’s shafts for a bullet proof assembly these can be fitted to 93 up engines and use the better set up of the tapered pinion. Clutch: Use the 91 main shaft preferably Andrews much stronger than factory stuff this has a spline rather than a taper which can shear the key and spin on the shaft, then use the later clutch basket as this has a double bearing, this along with a Bandit clutch is your ultimate set-up it’s what I use on my own stuff. Your stock factory clutch will slip at 90 to 95 brake. Stem seals: Stay away from Teflon stem seals they are a nightmare to keep on the guide better using Viton or factory seals. Valve seats: New heavy duty oversize valve seats should always be fitted to any high performance engine, we fit these at three times the factory fit, the evo`s have seats put in by the factory at as little as 2 thou I have seen these come out, when I was sub contracted to a dealership I have had warranty jobs on evo`s were the seats have come out on brand new bikes after as little as 50 miles running. The more torque the engine produces the more the factory seats will move around with the weak factory head castings causing blow-by this is made worse on performance jobs putting out 2 to 2.5 times the HP of stock. Our seat conversions have never had a failure even on 7 second pro-stockers or 24 hour endurance racing engines. We had an engine back twice from a customer who overheated it with too much ignition advance, the engine ran so hot that the wrist pins and cylinder studs were blue, the engine needed to be rebored each time but the seats never moved. Boring the factory seat ID makes matters worse. XL oil pumps: On early XL`s always use the later 98 oil pump P/N HD-26204-91A this pump has 40% more scavenging helps prevent wet sumping. Oil pressure gauge: I always use an oil pressure gauge installed were the oil pressure switch goes, do away with the oil pressure idiot light as when this comes on its too late anyway, the oil pressure gauge will tell you when somethings wrong in good time and also lets you know when your engine is up to temperature. Ring-gear: Use the 84 to 93 ring gear and jack shaft this has 66 teeth rather than the weaker 102 tooth gear and shaft that’s used on 94 up engines. HVHP oil pump: These pumps will increase oil pressure over the factory item, they were designed for engines running piston oilers so on evo`s with no piston oilers be careful on excessive oil pressure to the big end bearings as it can cause these to fail. We use these pumps with oil coolers. Valves: Always use one piece stainless valves we have seen the factory 2 piece valves fail on the dyno, increased spring pressure and faster ramped cams stress valves more. Honing: We always finish cylinders by plateau honing this basically runs the cylinders in on the honing machine as the rings would do. Always check and gap rings to tight a ring gap will take the piston crown of the piston. Cylinder Leakdown: Keep an eye on cylinder leak down as only 33% of the heat energy developed by each cylinder goes towards pushing the piston down its easy to see that an 8% cylinder leak means losing 24% of the recoverable power that’s going to the fly-wheels. 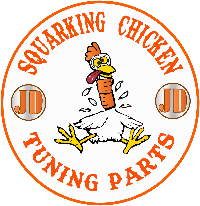 Valve springs: We find that 170lb`s to 180lb`s on the seat pressure is enough for performance cams and stainless valves this can be reduced for titainium valves, we always balance each spring we shim and set these to within 2lbs max. Change valve springs when they drop 15%, we have seen some springs lose 40lbs after running in.